Pump Primer: 44 • When a nation intentionally devalues the currency through expansionary monetary policy, what effect does it have on net exports and GDP? • When a nation intentionally revalues the currency through contractionary monetary policy, what effect does it have on net exports and GDP? 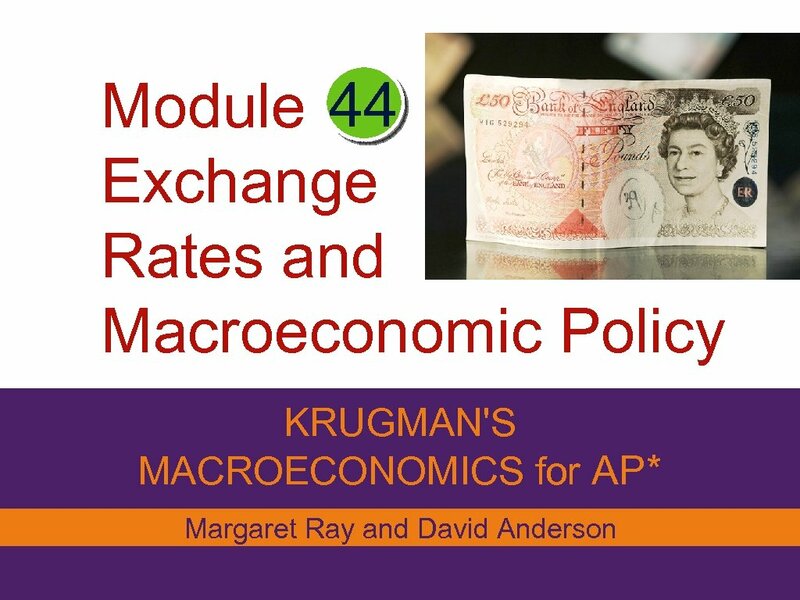 Exchange Rates and Macroeconomic Policy • In 1999, while most of Europe adopted the euro, Britain did not. Why? 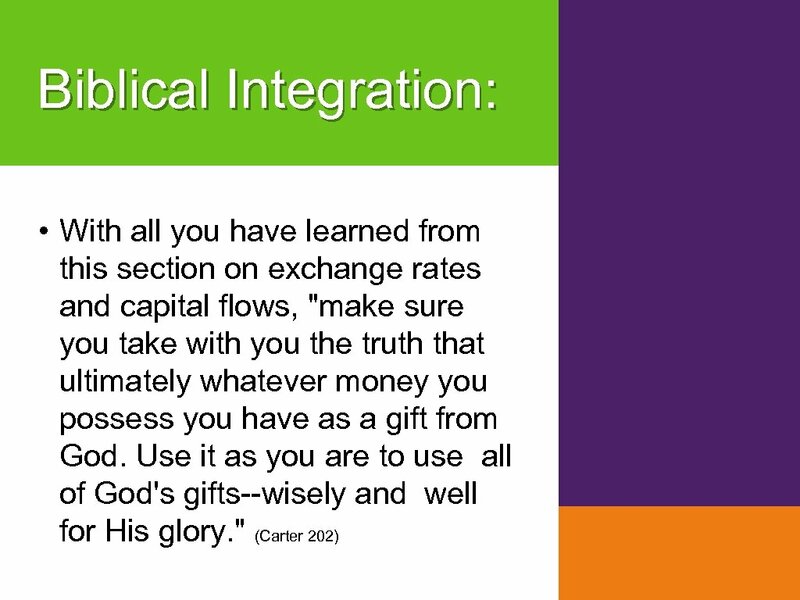 • There are economic arguments for and against adoption of a common currency. 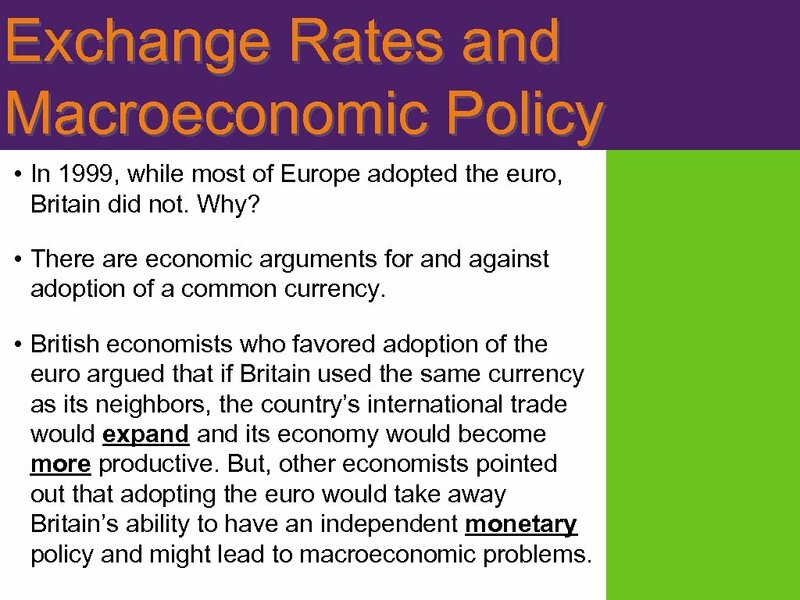 • British economists who favored adoption of the euro argued that if Britain used the same currency as its neighbors, the country’s international trade would expand its economy would become more productive. But, other economists pointed out that adopting the euro would take away Britain’s ability to have an independent monetary policy and might lead to macroeconomic problems. 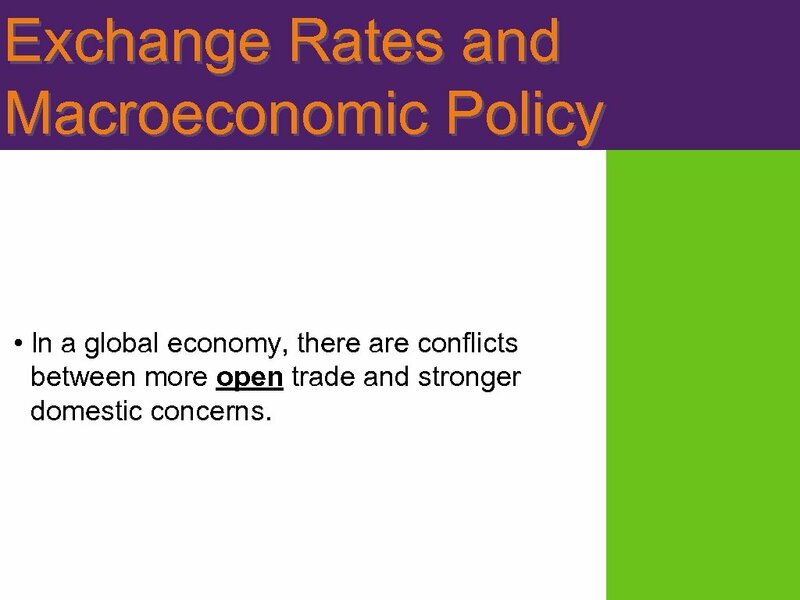 Exchange Rates and Macroeconomic Policy • In a global economy, there are conflicts between more open trade and stronger domestic concerns. 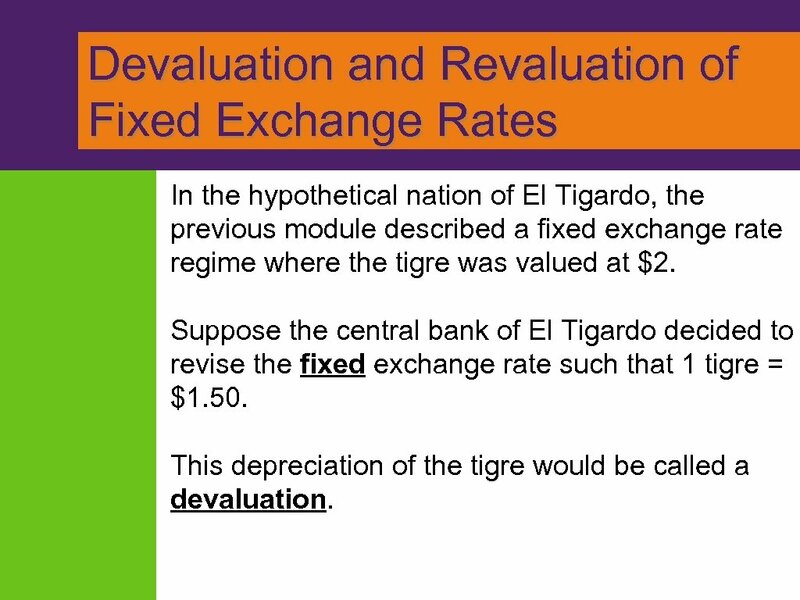 Devaluation and Revaluation of Fixed Exchange Rates In the hypothetical nation of El Tigardo, the previous module described a fixed exchange rate regime where the tigre was valued at $2. Suppose the central bank of El Tigardo decided to revise the fixed exchange rate such that 1 tigre = $1. 50. This depreciation of the tigre would be called a devaluation. 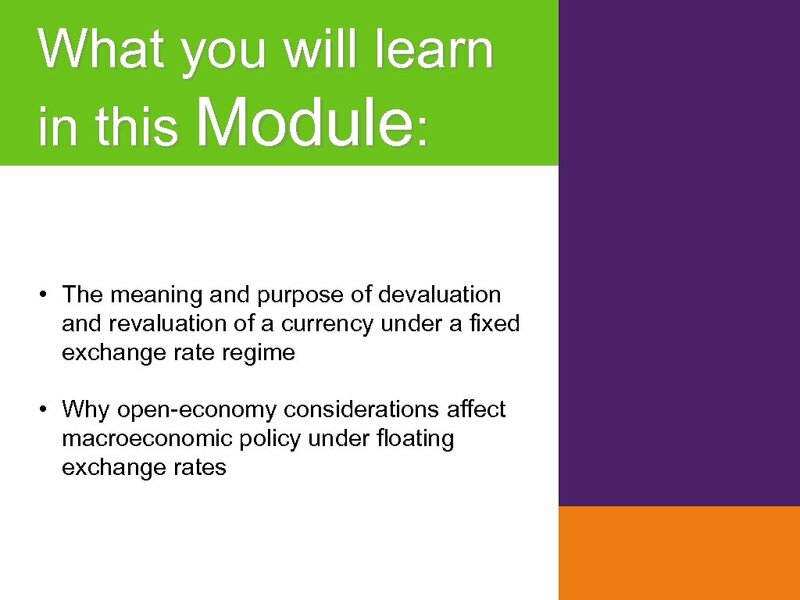 Devaluation and Revaluation of Fixed Exchange Rates Why would a nation want to devalue its own currency? Maybe El Tigardo has a recessionary gap. • It now takes fewer U. S. dollars to buy 1 tigre, so goods produced in El Tigardo would be less expensive for American consumers. • This devaluation would also make American goods more expensive to consumers in El Tigardo, thus reducing imports from America. • El Tigardo would experience an increase in net exports to America; aggregate demand would shift to the right, boosting GDP. 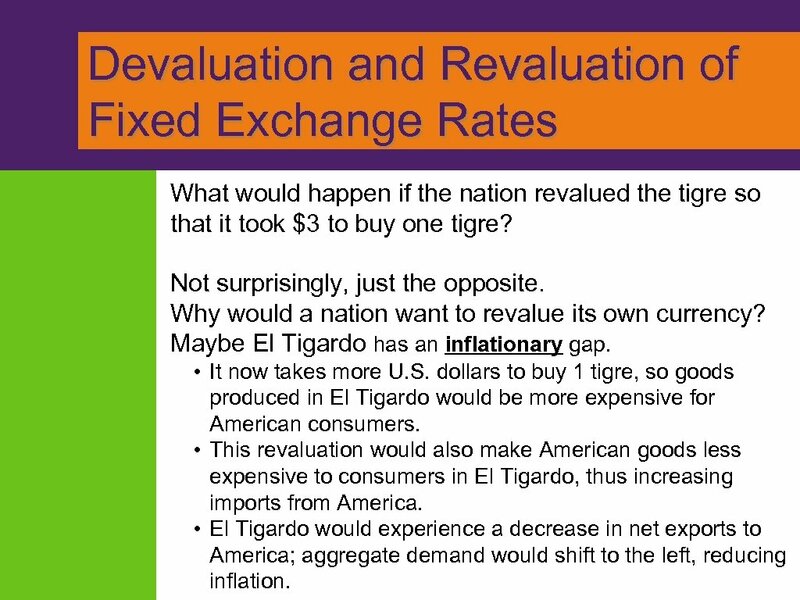 Devaluation and Revaluation of Fixed Exchange Rates What would happen if the nation revalued the tigre so that it took $3 to buy one tigre? Not surprisingly, just the opposite. Why would a nation want to revalue its own currency? Maybe El Tigardo has an inflationary gap. • It now takes more U. S. dollars to buy 1 tigre, so goods produced in El Tigardo would be more expensive for American consumers. • This revaluation would also make American goods less expensive to consumers in El Tigardo, thus increasing imports from America. 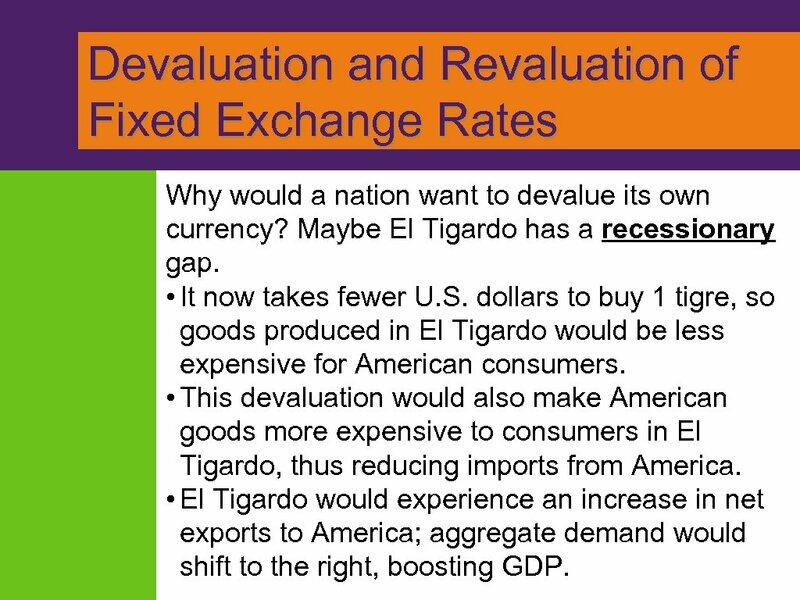 • El Tigardo would experience a decrease in net exports to America; aggregate demand would shift to the left, reducing inflation. 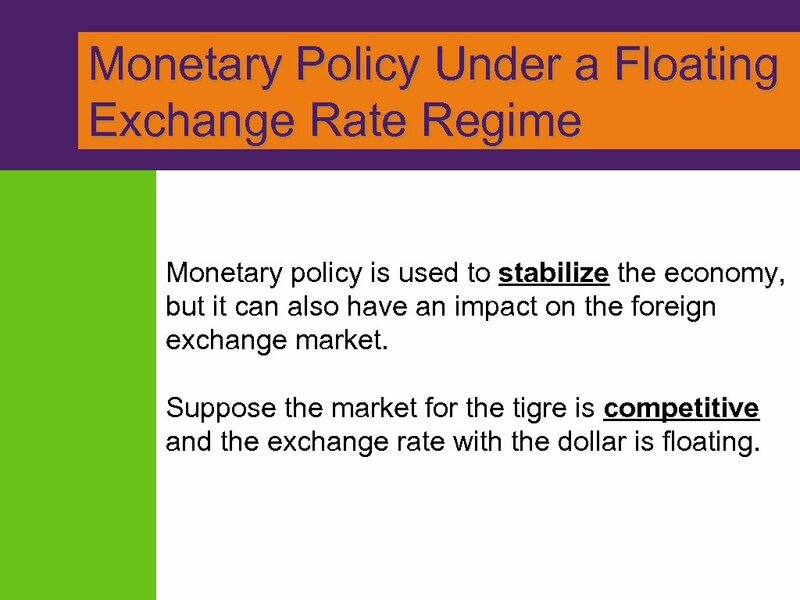 Monetary Policy Under a Floating Exchange Rate Regime Monetary policy is used to stabilize the economy, but it can also have an impact on the foreign exchange market. Suppose the market for the tigre is competitive and the exchange rate with the dollar is floating. 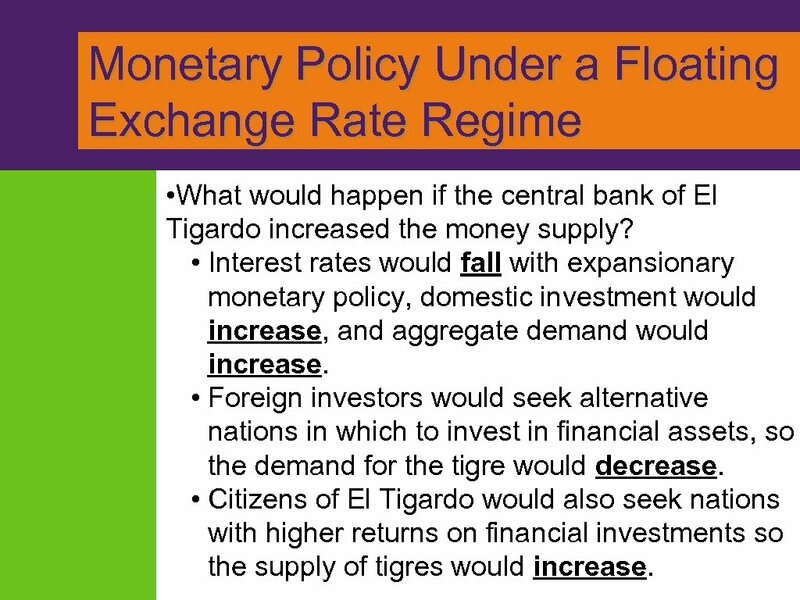 Monetary Policy Under a Floating Exchange Rate Regime • What would happen if the central bank of El Tigardo increased the money supply? • Interest rates would fall with expansionary monetary policy, domestic investment would increase, and aggregate demand would increase. • Foreign investors would seek alternative nations in which to invest in financial assets, so the demand for the tigre would decrease. • Citizens of El Tigardo would also seek nations with higher returns on financial investments so the supply of tigres would increase. 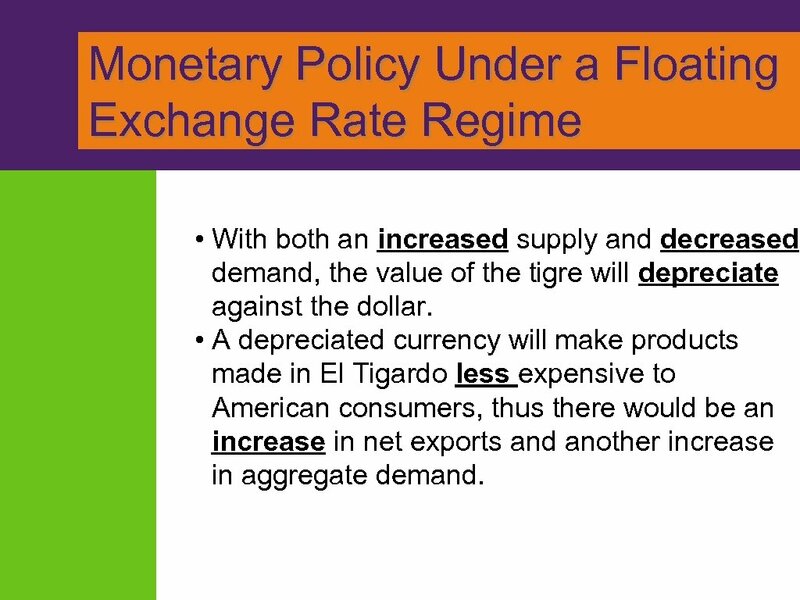 Monetary Policy Under a Floating Exchange Rate Regime • With both an increased supply and decreased demand, the value of the tigre will depreciate against the dollar. • A depreciated currency will make products made in El Tigardo less expensive to American consumers, thus there would be an increase in net exports and another increase in aggregate demand. 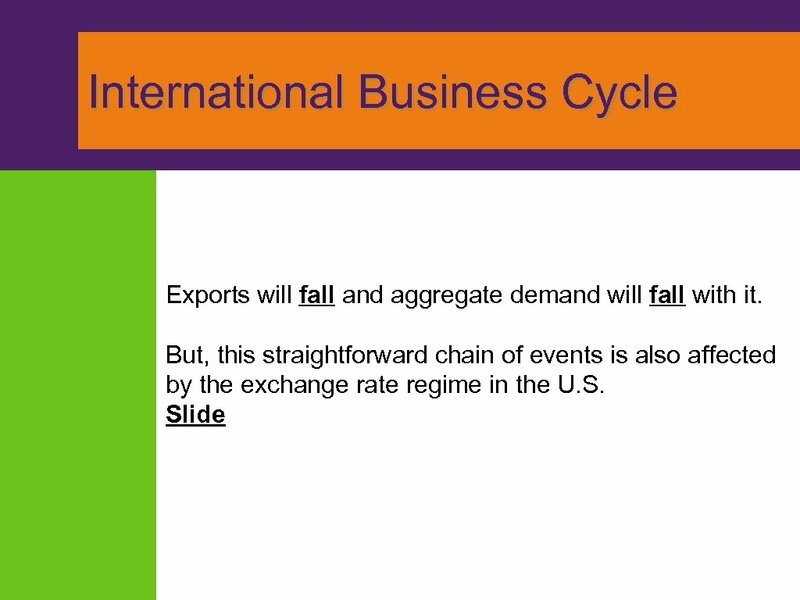 International Business Cycle A recession in Canada, the biggest trading partner with the U. S. , will likely cause a decrease in real GDP in the U. S. Why? Canadians buy many goods made in America, so a recession in Canada means American firms will ship fewer products to Canadian customers. 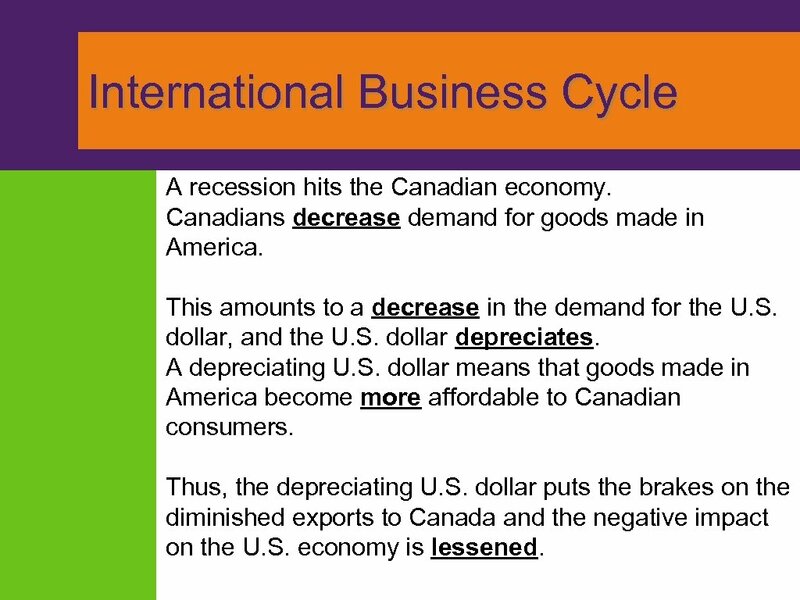 International Business Cycle A recession hits the Canadian economy. Canadians decrease demand for goods made in America. This amounts to a decrease in the demand for the U. S. dollar, and the U. S. dollar depreciates. A depreciating U. S. dollar means that goods made in America become more affordable to Canadian consumers. Thus, the depreciating U. S. dollar puts the brakes on the diminished exports to Canada and the negative impact on the U. S. economy is lessened. 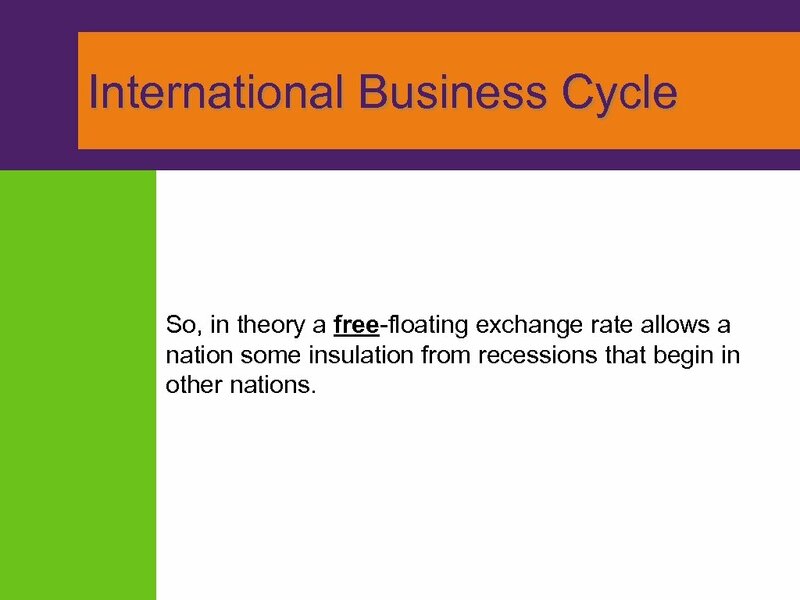 International Business Cycle So, in theory a free-floating exchange rate allows a nation some insulation from recessions that begin in other nations. © 2008 Eaton Corporation. All rights reserved.